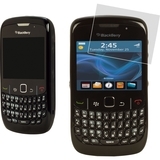 3M Privacy Screen Protectors for the BlackBerry Curve 8520/8530. Enhances your viewing experience by reducing glare with a light matte surface. Uses high performance removable adhesive. Easy to attach and leaves no adhesive residue when removed. Helps protect against scratches and damage to your LCD.